My son and vintage Dutch "granny" bicycles. 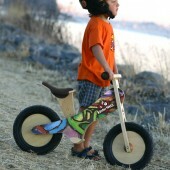 The Kinderfeets™ is a wooden balance bike for children 2 to 5. 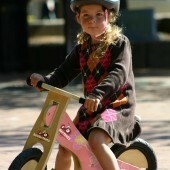 It provides a starting point for children preparing to ride a “normal” two-wheeled bicycle with pedals. To differentiate this balance bike from others we had these design objectives: -6 Chalkboard finish color options, this allows children to customize their balance bike with chalk. -Foot pegs for cruising, this will make the transition to pedals even easier. -Low step through frame, allows for lower settings of the seat and easy on-and-off of the rider. -Forever-Air-Tires, no more flat tires for absolute minimum maintenance. -Washable seat cover. 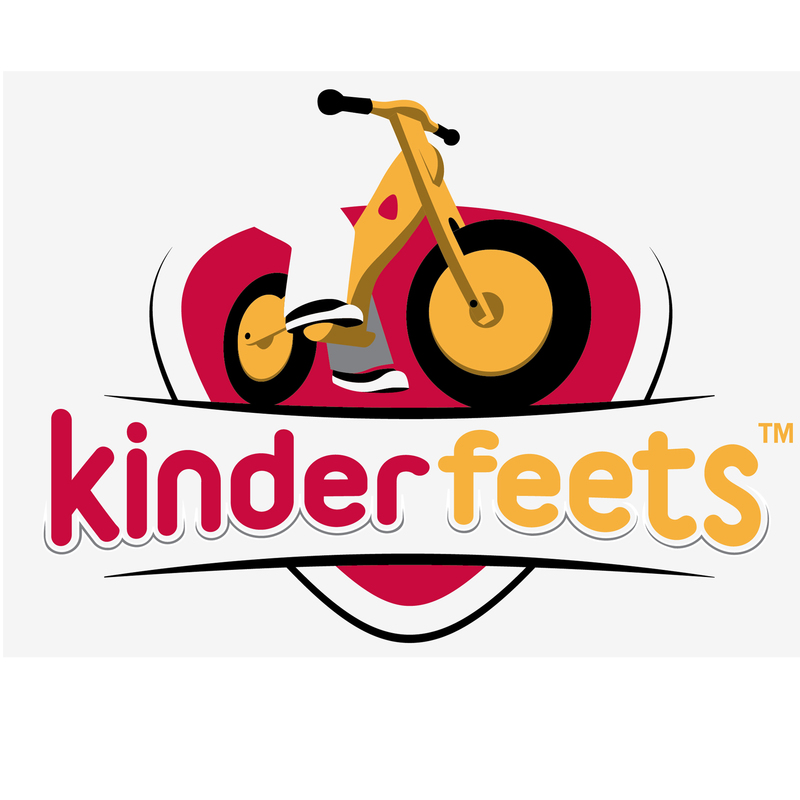 The Kinder Feets™ is a Patented balance bike, also known as a training bike or a running bike. It provides a great starting point for children preparing to ride a “normal” two-wheeled bicycle with pedals. It’s a clever alternative to training wheels and is considered a superior form of learning to balance on two wheels. The Kinder Feets™ is for ages 2 and older and can carry a maximum load of 70 lbs. These are some of the key features the Kinder Feets™ has over other push bikes: footpegs for cruising, low step through frame allows for lower settings of the seat, Forever-Air-Tires, washable seat cover and chalkboard finish colors! 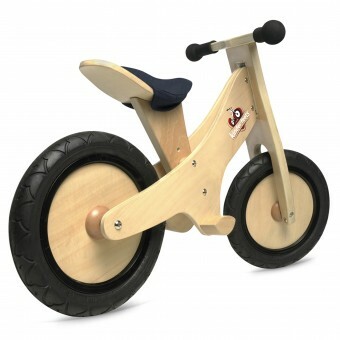 The existing wooden balance bikes have some issues. 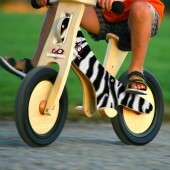 When my son was 2 year old he didn't fit on them yet, when he finally did he had nowhere to put his feet when cruising. He also wanted to draw on them but couldn't due to the material. I have been a professional designer for 20 years so this was a great design challenge for me. these were the final design objectives, we have also received a patent on them: -6 Chalkboard finish color options, this allows children to customize their balance bike with chalk. -Foot pegs for cruising, this will make the transition to pedals even easier. -Low step through frame, allows for lower settings of the seat and easy on-and-off of the rider. -Forever-Air-Tires, no more flat tires for absolute minimum maintenance. -Washable seat cover. Oscar V. Mulder, a dutch designer living in California designed the Kinderfeets. Kinderfeets Toy by Oscar Mulder is a Nominee in Toy, Games and Hobby Products Design Category. · Click here to register today inorder to be able to view the profile and other works by Oscar Mulder when results are announced. Kinderfeets Toy by Oscar Mulder is Winner in Toy, Games and Hobby Products Design Category, 2012 - 2013. · Press Members: Login or Register to request an exclusive interview with Oscar Mulder. · Click here to register inorder to view the profile and other works by Oscar Mulder. Did you like Oscar Mulder's Toy Design? Did you like Kinderfeets Toy? Help us create a global awareness for good toy design worldwide. Show your support for Oscar Mulder, the creator of great toy design by gifting them a nomination ticket so that we could promote more of their great toy designs.